The basic guidelines below include typical patient workup, common patient management issues, practice tips, fre- quently asked questions, and common misconceptions regarding the protocol. These guidelines do not completely explain the WT3 protocol and are intended for doctors who have already read the Doctor’s Manual for Wilson’s Temperature Syndrome. The Doctor’s Manual details how to maximize the benefits while minimizing the risks of T3 therapy. It is imperative that doctors read the manual before trying to treat Wilson’s Temperature Syndrome with T3. 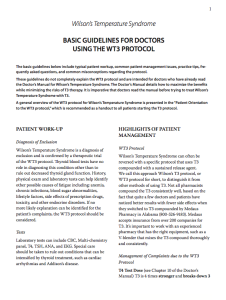 A general overview of the WT3 protocol for Wilson’s Temperature Syndrome is presented in the “Patient Orientation to the WT3 protocol,” which is recommended as a handout to all patients starting the T3 protocol.